This is one simple and userful module. Its main function is to make your website content float in the edge of the site, you can click one icon to expand content and view. You can put HTML or one third-party module in the floating panel. When releasing a web product, there is nothing more beneficial than receiving early feedback from your users. Unfortunately, many websites make it unnecessarily difficult to send your feedback or lack this functionality altogether. Today we are making a simple module to solve this problem, this form sends the users’ suggestions directly to your mailbox. When you publish something online, there are not that many ways to determine whether people like what you have to say. Comments, the cornerstone of blogging, are too demanding, and users often prefer not to post one. Appreciate Badge module is a neat solution to this exact problem. With it people share their appreciation for somebody ’s work. Test Html gegdfdg DNNSmart Super Form is a powerful and flexible form module. It can allow to add several steps in the backend and configure how many feilds in each step and field type. 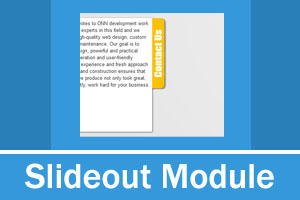 By using this module, you can custom template of each step and e-mail template. It has a intuitive User interface that helps you to create forms easily. It can record date of submitting, IP and Country of persons who submit forms. VLinks is a link module which is easy and convinient to use. The function is very useful and it can save space for your pages. It can also help you to check report of each clicked link and record IP, country and user info. There are four kinds of types. Although DNNSmart was newly founded in August 2012, we devoted to DNN development work since 2008. We specializes on the DotNetNuke (DNN) Content Management System including DNN skin design, DNN programming and website construction. Our development team is located in China, our professional and outstanding developers are passionate about web design, programming and web applications. We strive to provide high-quality web design, custom development and maintenance. Our goal is to provide unique design, powerful and practical functions, easy operation and user-friendly interface. Our rich experience and fresh approach to website design and construction ensures that all websites that we produce not only look great, but most importantly, work hard for your business. As a result of our good products and outstanding customer service, we have gained good reputation from many clients all over the world.